Tire maintenance is an essential part of overall vehicle maintenance. As they are your vehicle’s only point of contact with the ground, the condition of your tires can have a significant impact on your driving experience. One of the most noticeable ways in which improperly maintained tires can affect your driving is in how your vehicle handles. Good tires are important for traction and for proper steering. Poorly maintained tires also reduce fuel economy, forcing you to spend more at the pump. 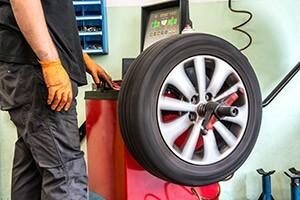 In order for your tires to give you good fuel economy and keep you safe while you’re on the road, you need to practice good tire care by maintaining proper tire pressure, wheel alignment, wheel balance, and sufficient tread depth. Both overinflation and underinflation can hinder the performance of your tires, lowering fuel economy and causing other performance issues. An underinflated tire, because it bends and flexes, causes rolling resistance. An overinflated tire will bulge and make less contact with the road. Both can contribute to much faster tire wear and issues with steering and stopping. It is a good idea to check your tire pressure at least once a month. Your vehicle’s wheel alignment should be checked regularly, as alignment can change over time through regular wear while driving. When a vehicle’s wheels are misaligned, the tires put up greater resistance and can increase drag to such an extent that your fuel consumption may increase by as much as 25%. This resistance causes tires to wear down quickly and unevenly. Misaligned wheels can also cause your vehicle to “pull” to one side while you are driving. The wheels and tires on any vehicle are never all exactly the same weight. Even if the weight differences are small, they can cause wear to your tires, suspension, and steering over time. Unbalanced wheels can also cause your vehicle to vibrate at high speeds. Wheel balancing ensures that the wheels can spin smoothly, and should be done every time you replace your tires. The depth of your tire tread is important for giving your tires a good grip on the road, especially during wet, snowy, and icy conditions. As the tread wears down, your tires will suffer from decreased traction and handling. When a tire’s tread has worn down past its wear indicators, then it is no longer safe nor legal to use. The condition of your tires is important for ensuring that your vehicle is operating at its highest level of performance. It is crucial that you equip your vehicle with quality tires and have them expertly serviced and maintained. Fortunately, your dealer is your one stop shop for all of your tire and tire maintenance needs. By taking your vehicle to the professionals who know exactly what your vehicle needs, you can rest assured that you’ll be getting the right tires and the right tire services to optimize your safety and fuel economy.